The Midnight Review: The Evil Hindus Invade Manhatten, America With "Ground Zero Temple"
The Evil Hindus Invade Manhatten, America With "Ground Zero Temple"
If you thought the Muslims trying to build the "Ground Zero Mosque" was bad, I would like to bring to your attention the dangerous infiltration of America by a far worse "faith" - Hinduism. That's right, the cow-loving religion of Asia has grabbed a foothold all across America. Islam is only a distraction from the real threat. Sure they have gained notoriety as being the face of convenience stores and taxicab drivers, but that was their plan from the start - to give the appearance of being harmless capitalists, but in reality they are here to subvert the nation and supplant the Constitution with their cult-like scripture, the Bhagavad Gita. There is no room for a religion with a god called "Shiva, the destroyer" - that is just pure hate! Did the Christian god or Jesus ever destroy anything? 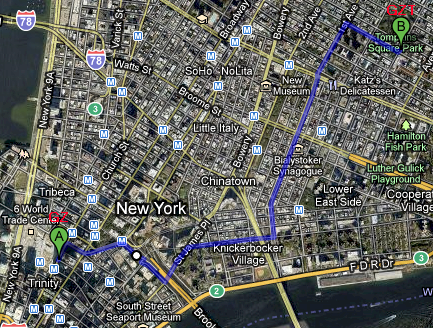 And look - there is a Hindu temple just 11 minutes away from Ground Zero! America must protest this Ground Zero Temple, which aims to trivialize the loss of life on September 11th and claim victory in the name of Shiva (just right before Shiva is to destroy us). They even infiltrated the government at some of the highest levels! Louisiana Bobby Jindal (a.k.a. 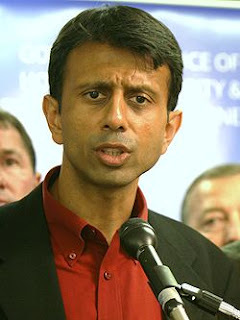 Piyush Amrit) was supposedly born in Baton Rouge in 1971 but has anyone seen his birth certificate? According to Hindu law, Jindal was born a Hindu, and his wife is also a Hindu - she even created a non profit foundation - The Supriya Jindal Foundation for Louisiana's Children - to indoctrinate Lousiana's youth by aiming to improve math and science education - an enemy of Christianity. She is even working on a PhD in marketing, presumably to better spread Hindu across America, and what better place to start then in the center of the Bible Belt, making Hinduism the "buckle." You don't think that's enough proof? Just look at what Jindal's name means in Hindu and Sanskrit - Piyush means "drink of the gods" and Amrit means "without death" or "immortal." That roughly translates to "drink the kool-aid and live forever." I am sure that if a Hindu terrorist were to strike America, they would yell "Piyush Amrit" during the attack. Wake up, America! We must restore the honor of America and prevent it from being destroyed by Jindal and Shiva - the Hindus want the Muslims to be the focus of the Christian's holy war so they can target our great nation unopposed! Disclaimer: The above post is satire, making fun of the right's hatred towards Muslim-Americans, or any non-Christian religion for that matter.